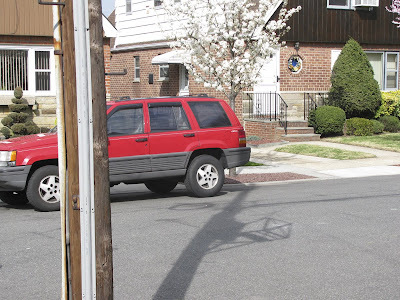 That pole is the central pole for all the cables for Time Warner, Fios, the phone company and every other friggin' company that provides some sort of service in the neighborhood. Shadow Shot Sunday is Hey Harriet's meme and she and other participants can be found here. I see the finger and I see the hand, but why is the fist holding one of those box kites? I love it Mary! It does look like a pointing finger and what a beautiful tree! I know nearly all of our poles around here look the same way! Technology! can't live without it anymore, but it sure ain't pretty!!! Thanks for a great SS! it does look like a big finger. And a lovely little tree. Great eye there Mary, it does remind me of a finger pointing...that tree is lovely! Ah, the joys of spring! Yeah, it does look like a finger. Fun! Why don't they just bury them, then the wind and ice wouldn't bring 'em down so often...must be a hair-brained reason somewhere! why is it that sometimes the shadow is so much more beautiful and interesting than the object?? Great shadow. I agree with Jamie, I also see that kite! Nice to know that the controversial pole casts a beautiful shadow pointing the way to some treasure of Nature! Couldn't help but laugh at your frustrated comment! But I do sympathasise! Advanced technologies are not so super human as we would like them to be! Always seem to miss the small commonsense things. I wonder too why all wires are not underground! Well, it looks as though one vehicle sliding into that lone pole could make life very miserable for everyone. Besides, there would be no shadow to point the eye towards the beautiful ornamental pear. Maybe then they would bury the wires underground. Cool shot with bonus of red. I like! My mum send regards to you and all ladies who joined this meme telling that she feel better after the ops. I started to like you meme, too... cool to chase one. Great shot and you are right..it does look like a finger pointing at the tree..Beautiful tree..very clever shot on your part. You are right....that "finger" leads you right to that flowering tree! Only one pole for all that stuff? Yikes! Very pretty pear tree... and I guess it's a pretty important pole too. I really like this shadow shot!